I thought I would write a post today giving a few tips and tricks I have learnt over the past few years when struggling to get enough natural light to take blog images in winter. 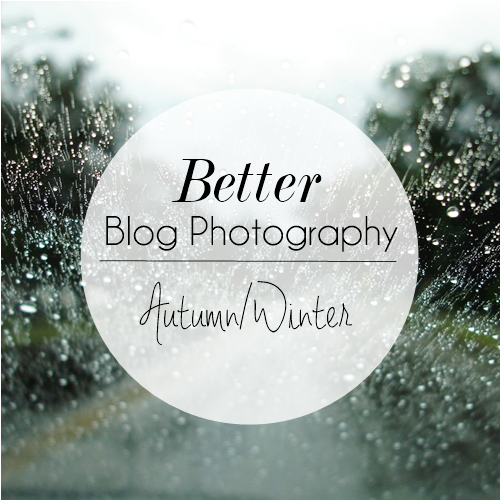 I really wanted to tackle this as I know most bloggers, myself included, don't own professional lighting, so when autumn/winter comes along taking images for your blog can be hard work. So instead of suggesting things you can buy such as lighting/a tripod, or even a better camera I thought I would share some tips that everyone can try! Take your photos in daylight! My first tip probably seems really obvious but in winter make sure to take your blog pictures before it starts going dark. I know this can be pretty impossible if you work full-time and just blog as a hobby, but maybe think about taking all the images you need for the week at the weekend during the day. Around noon is probably the best time to take your blog pictures in winter. Even if you are taking your images in daylight in winter some days can be so dark & miserable that it can be a challenge to take non-blurry photos. One mistake that lots of people make is turning the light on, this will only make your images look yellow/warm toned and it will also create shadows. So even if you feel like the room is dull or even dark, leave the light off. Also in my opinion flash ruins photos that are taken inside, close up, so I would always turn off auto flash. Next you want to be as near to a window as possible, the more daylight you can have on your products the sharper your images. Only last week when it was such a dull day I took my blog pictures on a door mat in the kitchen as I have a glass patio door that lets in the most light. Whether you place a chair next to a window, take your images on a window sill or even outside (I do this sometimes on my garden table!) simply find the seemingly brightest area. It can be a white A4/A3 piece of paper, an A2 piece of mounting board or free wallpaper samples, anything as long as it removes where you are taking your images... because lets face it no one wants to see a mouldy window sill or what your kitchen floor looks like. A lot of the time if you aren't in even lighting (lighting that is directly/all around your subject) you will find that the products you are photographing can cast shadows. To minimise this place a mirror out of shot on the side of the shadows, this will just illuminate the light in that area and reduce the shadows. I personally use a full length mirror that I lean against the arm of the chair I take my photos on, but if you can prop it up even a makeup/free standing desk mirror. A lot of the time when dealing with low lighting conditions you get blurry images because the camera isn't as still as it needs to be. Now if you know a little more about cameras I suggest you take your camera off the Auto ISO setting or if you always set it higher when shooting in bad lighting actually bring it right down. I suggest doing this as a high ISO or an AUTO ISO in dull/dark lighting will only give your images lots of noise (when your pictures look grainy) which of course not what you want when taking detailed images. Here is a comparison of an image taken with a low ISO and a high ISO. So as you can see you want to be opting for a low ISO. My ISO is always set no higher than 200 for blog images, this does make my images darker however I know I can edit the brightness afterwards, as basically what I am after is high quality images. However using a lower ISO means you need to hold the camera really still, so if you don't have a tripod, rest your camera on a pile of books or anything you can. I sometimes build a little tower of beauty boxes to get the right level that I want to take my images at. This will prevent the camera from shaking half as much when you are pressing the shutter button to take the image. However if you need/want to hold the camera make sure to keep your elbow in to the body and also if you can, kneel down on one knee and use your other knee to rest your arm or elbow on. Even when I do all the above measures in winter my images can look dull, (also because I use a low ISO) but I have made sure my images are as sharp as they can be so when I do brighten them they will look good and like bright natural daylight. As you can see from my example, brightening the image below made a huge difference. I don't use any fancy editing programs just a piece of software called PhotoScape (CNET download - here) which is a free & easy program that once you get the hang of is very straightforward to use. The 'bloom' tool is what I use to most as you can brighten areas more than others which is great when you have a certain area of the image that is dark. Though you could even use Windows Live Photo Gallery if you have Windows operating system. Also after you have brightened your image you may also want to sharpen it slightly, which is just a click of a button with Photoscape and most photo editing programs. I really hope this have been helpful and takes some of the stress out of snapping your blog pictures on any of the miserable winter days to come.